​Day 1: Arrival in Nadi, Fiji – BULA!! Upon arriving into Nadi International Airport, getting to Beqa is a breeze. You will be taken on a 2.5 hour drive along the beautiful Fijian Coral Coast to Pacific Harbor, only to be greeted by the wonderful boat crew. 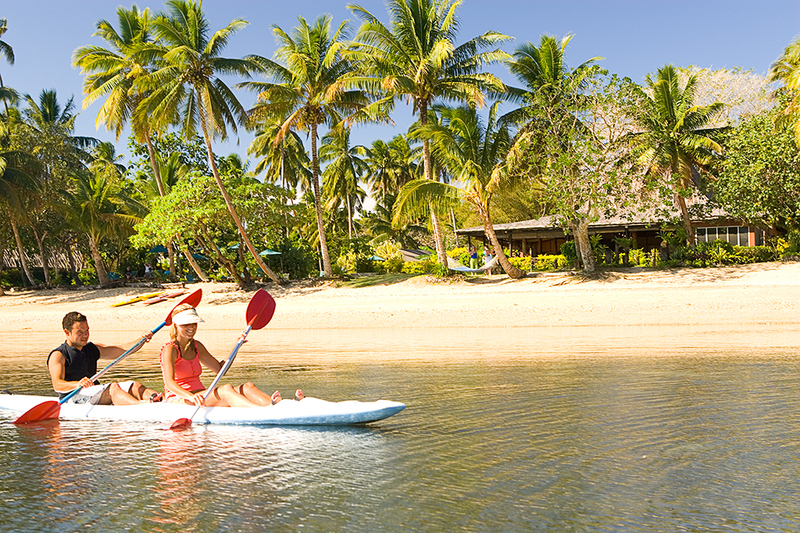 It’s a quick boat trip over to the island paradise of Beqa Lagoon Resort and a true Fijian ‘Bula!’ welcome. Located in the heart of the Fiji Islands is the secluded island paradise – Beqa Lagoon Resort. Set amidst the lush, tropical gardens are 25 deluxe air-conditioned Fijian style villas with private plunge pools, exotic koi ponds and beautiful ocean views. No roads, no cars...just a simple footpath to take you where you need to go. The onsite PADI Scuba Diving operation will reveal the amazing underwater world of the calm and pristine lagoon to you. Over 100 dive sites are just a short boat ride away including walls, wrecks and the thrilling SHARK and BIG FISH encounter…plus enjoy unlimited shore diving and snorkeling just steps off the beachfront. There are only a couple of places on this planet where you can dive with the “Sea Tiger” eye to eye, up close and personal - one of these sites is Cathedral, Beqa Lagoon Resort’s own Tiger Shark dive. Cathedral is a once in a lifetime experience - multiple shark species in clear water, just a 15 minute boat ride from the resort. Fun afternoons include deep sea fishing, surfing, kayaking, paddle-boarding and hiking to the mystical waterfalls. You may also choose to relax poolside with a tropical beverage or unwind with a massage at the beachfront Lali Spa. Enjoy gourmet dining in the open air Bure Kalou and the friendly Fijian hospitality of the Beqa Staff. At Beqa, you may immerse yourself in the daily Fijian culture experiences of Firewalking, Meke ceremonies, Kava tasting and much, much more. Beqa is the bomb for families with its summer Sea Camps and perfect for active honeymooners looking for romance and adventure. Return to the airport in Nadi for flights home.